There aren't many of Pamela Macgregor Morris' books that I can feature on the PBOTD because they're illustrated by Lionel Edwards, who I can't use for copyright reasons. 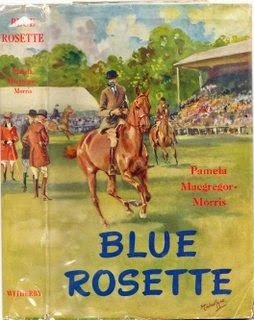 Fortunately The Blue Rosette (1950) is illustrated by Michael Lyne. It's one of those books I never have managed to get my hands on. I've never even had one and sold it.